Our locksmith technicians can assist you with almost any residential lock & key requirements which you have! We take residential safety seriously and we only employ skilled locksmith experts. Just the top lock manufacturers and supplies are carried by our locksmiths, however, we are able to work on just about any kind of lock or safe. Biometric lock installation, home safe opening, and the installation of access control are several good examples of our more complex home service applications. Our normal residential tasks include things like opening door locks, lock re-keys, and gate lock replacement almost everywhere in Phoenix, Arizona. Should you have any issues which are not explained on this page specifically, you can give us a call anytime and ask one of our experienced lock & security techs! Great experience! I was locked out of my apartment around 3:00 in the morning and within a short time Jack responded and was quick to help me! He was very kind, professional and did a great job. I can't thank you enough for helping me at such an inconvenient time! Would recommend to everyone needing a locksmith. Super courteous and quick to replace all the needed cylinders. I would definitely call on them again. I recently needed to replace the locks in my home and was interested in upgrading to a keyless lock system. Phoenix Lock smith pros made it very easy for me. Their technician arrived quickly and was able to replace and upgrade our locks for a great price. YOU GUYS ARE THE BEST! I locked myself out of my house yesterday morning. While I waited for family to come rescue me, which is a long story, I called Phoenix Locksmith Pros. Jack showed up on time, and got me into my house and re-keyed my locks and was done in about a half-hour. He was very professional, and polite. Thank you Phoenix Locksmith Pros! The best customer experience I have ever received from a locksmith! Service was A+++++ and perfectly on time. Thank you Phoenix Locksmith Pros for making a key on the spot! Would recommend to anyone needing Residential Key/Lockout services. Thank you guys! I recently had things go south with a roommate and needed to re-key the locks to my house. I called Phoenix Locksmith pros and they're technician arrived on time and changed out our locks and gave us new keys very quickly. Would highly recommend them for your lock and key needs. 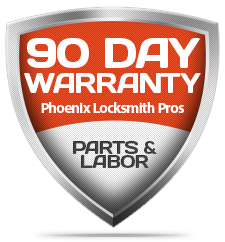 Phoenix Locksmith Pros are great! We needed new locks for our new house. I called and spoke with Aaron on the phone. He was very nice and answered all of my questions. Their technician came out to put new locks on our house he was very nice and did a great job installing our new locks! I highly recommend them! I am so impressed with Phoenix Locksmith pros service!! They are fast and friendly. After a recent break in, we decided to step up our home security, among other changes we decided to upgrade to keyless locks on our doors and installed locks on all our windows. Phoenix Locksmith pros sent over one of their technicians right away and were very helpful in replacing and installing all of the new locks in our home. Will definitely be calling back when I need a locksmith again. Thank you guys! Showed up in a timely manner. Was very professional and got the job done right. highly recommend. Accidentally locked myself out of my home! Great company! Quickly arrived with call upon route to keep me updated on arrival time. Provided great service and price was the best I found calling around as well.